Sea Marge Hotel01263 579579work01263 579524fax HotelPerched on the cliff tops of the beautiful North Norfolk coast, you will find an elegant Edwardian mansion steeped in history. This fine Grade II listed building, resplendent in 5 acres of terraced gardens is the ideal location from which you can discover the unique diversity of both coast and countryside. 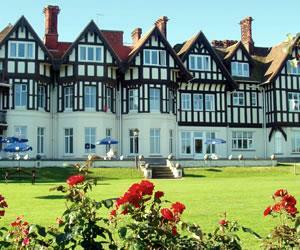 The building was commissioned in 1908 by a German banker as a seaside country residence for his family and friends. At the time, Overstrand and the surrounding 'Poppyland' was a fashionable holiday destination for the rich and powerful and indeed, Winston Churchill himself was a frequent visitor. Following years of neglect, the building was restored to its former glory and opened as a hotel in 1996. All rooms, which are decorated to the highest of standards and in keeping with the ambience of this fine Edwardian building, contain all the benefits and amenities that are the hallmark of a hotel of this calibre, e.g. flat screen TV's, DVD players in superior rooms and much, much more. In house Frazer's Restaurant combines the elegance of a bygone era with 21st century style, to create the unique atmosphere for you to appreciate an inimitable blend of traditional and contemporary cuisine. Superior twin bedded rooms - view of terraced gardens and out to sea. Standard double bedded room with view of side gardens and Overstrand village. Kingsize bed. Double or twin. Superior double room with view of terraced garden out to sea. Standard double room - with own separate bathroom with Delft tiles. Perched on the cliff tops of the beautiful North Norfolk coast, you will find an elegant Edwardian mansion steeped in history. This fine Grade II listed building, resplendent in 5 acres of terraced gardens is the ideal location from which you can discover the unique diversity of both coast and countryside. Add to this, attentive yet unobtrusive service and you will be assured of a stay so memorable, that you will want to return time and time again. Next to an unspoilt beach. Children welcome from any age. From Cromer follow the B1159 signposted Overstrand and Mundesley. Travel for about 2 miles and you will come to the village of Overstrand itself. After passing Overstrand Church, take the second turning on the left by the Overstrand Village sign. The Sea Marge can be found on the left, just past the White Horse Public House.